I am always looking for new games to try out with the kids. A few companies recently sent complimentary games to try. I thought several would be perfect family games for most any location. All opinions are my own based on trying these on our family game nights. Family game night can happen any where. 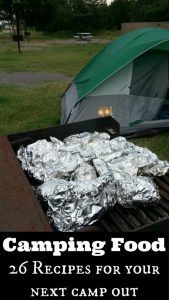 So whether you are looking for an easy game to play while camping, at home on family game night, or in the backyard, we have a few family games for you to try. We liked these games so much, we are hosting a Family Game Night Giveaway where you can win one of each of these games listed. More on that in a minute. First, let me tell you about these games. This small, compact game is perfect for the car, plane, or on the trail. The game board is magnetic and self contained making it easy to play when you travel. I have reviewed another game from Outside Inside Gifts, Freestyle Barrel Toss. It’s similar to disc golf . All of the games made by Outside Inside Gifts are geared towards active people you like to get outdoors and travel. Object of the game: Capture as many of the opponent’s game pieces and flip them to your color. Game includes: Folding metal game board, 64 dual sided magnetic disks, instructions, and carry bag. This 2 player game starts with each player choosing to play as either black or white. They place 2 magnetic game pieces of their color on the board to begin the game. On their turn, each player will place another game piece on the board to try and flank the opponent’s pieces. They then capture those pieces and flip them to their color. 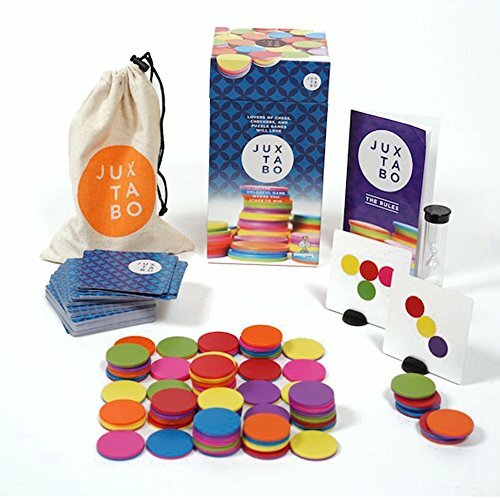 Forget playing chess or checkers in the park, play Juxtabo instead. This strategy game has players looking to create specific color combinations that match their Challenge Cards. Since game tokens are dual sided, you can use strategy to figure out how to stack and get the color you need to create the match and win the card. Object of the Game: Place your game pieces on the board to create as many Challenge Card color combinations as possible. Game includes: 125 Challenge Cards, 126 Juxtabo playing pieces and carry bag, 8 card holders, 1 minute timer, and rules booklet. 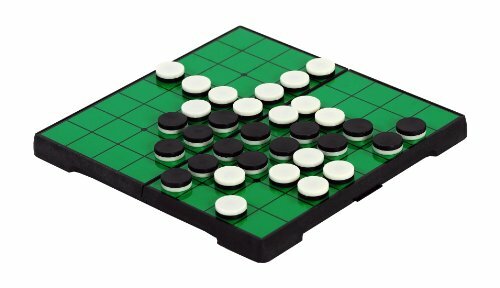 This 2-4 player game starts by constructing a game board with Juxtabo pieces. You can create a 4×4, 5×5, or 6×6 grid with random colors. Each player gets 7 Juxtabo pieces and 2 Challenge Cards to start. The rules booklet offers several different forms or game play and suggestions for different games ranging in difficulty. But the basic version has players place their game pieces on the board to create a matching color combination to a Challenge Card in their hand. Each player continues play until they can no longer create a match and then play passes to the next player. At the end of the game, the player with the most completed cards wins. Classic games made specifically for travel. This games from The Purple Cow is a 2 in 1 game housed in a convenient metal case. Magnetic pieces make playing in the car, train, or plane convenient and hassle free. A plastic case connector also helps secure both halves together and prevents game from moving around during play. 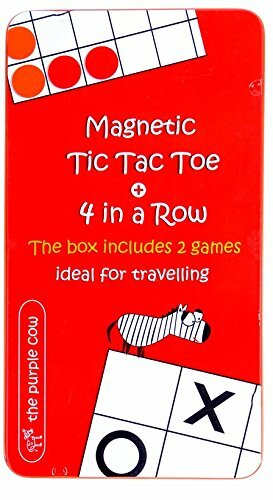 Game includes: magnetic box and game board, 10 large magnets for Tic Tac Toe, 22 smaller magnets for 4 in a row, plastic hinge to connect both halves of case. 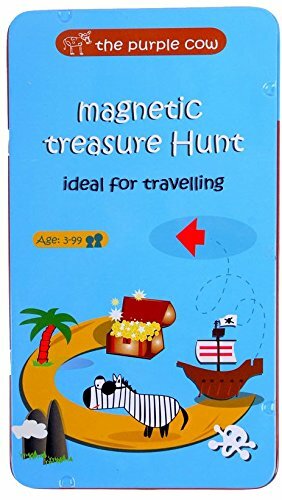 This is a classic style board game similar to Chutes and Ladders made into a magnetic travel game. Roll the dice and move your pirate along the path towards the treasure. But watch out because if you land on the wrong spot, you’ll have to go backwards instead of forward. Object of the Game: Be the first pirate to reach the treasure chest. Note: The dice on this game is small so it can fit inside the case. I ended up storing it inside a small plastic bag when not in use for prevent it from getting lost. Have you ever wanted to piece together a torn up map to find a treasure? 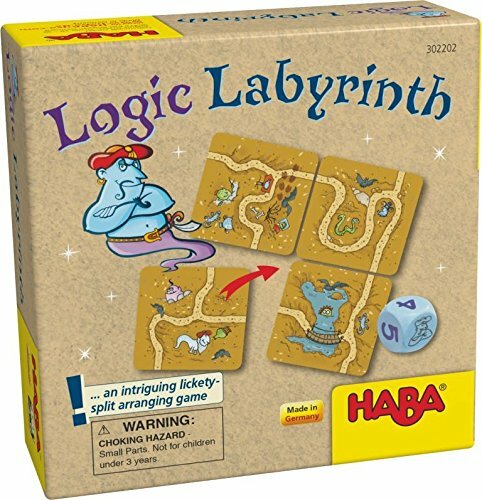 This game from HABA makes you do just that! Piece together your map pieces the fastest to collect the Genie’s treasure. Object of the Game: Piece together your map pieces first and claim the treasure. Game includes: 30 path cards, 12 treasure cards, 1 dice, and game instructions. Game can be played with 2-4 people. Treasure card(s) are placed face up and the 1st player rolls the dice. Everyone picks the the same number of path cards as the number of the dice, then quickly create a complete map. The first one to do so, wins the treasure. Game play ends after 4 rounds with the winner having the most treasure cards. Enjoy this game of cat and mouse. Each player is either a cat or a mouse and all have fun in this fast paced game. Object of the Game: The player who is the “cat” tries to capture a mouse with its cup. Game includes: 6 wooden mice, wooden cup, colored dice, dice with dots, rules booklet. Game can be played with 2-7 people. Rules booklet offers different game versions. 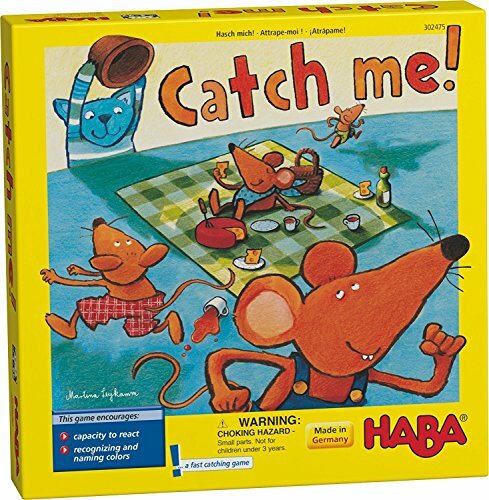 But with every game the “Cat” rolls the dice and when it shows the “signal color”, he attacks the mice on the table and tries to capture one or more with his cup. 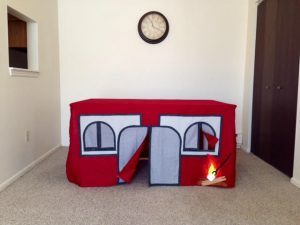 Kids of all ages can enjoy love the anticipate of fleeing the cat and game play can get loud at times. This reasoning game is more family fun based STEM project than college party game. Players grab a challenge card on each turn and then try to figure out how to reach the target within 3 tries. 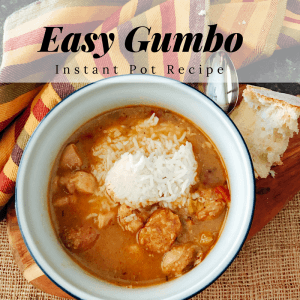 It’s ready, aim, fire family fun! Object of the Game: Launch your ball into the target within 3 tries. 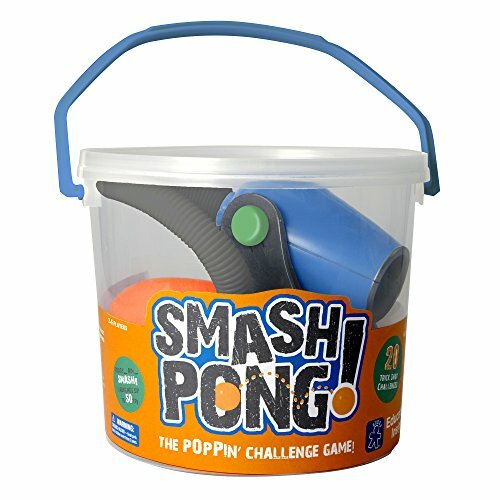 Game includes: Smash Pong launcher, 6 ping pong balls, 20 challenge cards, game guide, and lidded plastic carrying bin. Game can be played solo or with others. The challenge is to figure out the best way to complete each challenge. What’s the best way to shoot off a table onto a ground target? If you are using your foot, how hard or soft do you step down on the mechanism to fire the ball? The challenges gives you a new perspective on how to play the game and allow you to create countless new ways to aim at your target. Makes a great outdoor game. What do you think about this collection of fun travel games? Which ones would your family enjoy most? Like I said before, we really enjoyed these games. So we are giving one lucky reader a Fun Any Where Family Game Night Prize with all of the games we talked about. 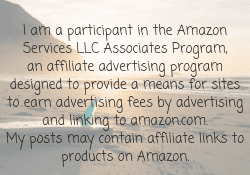 To enter, use the Rafflecopter below. 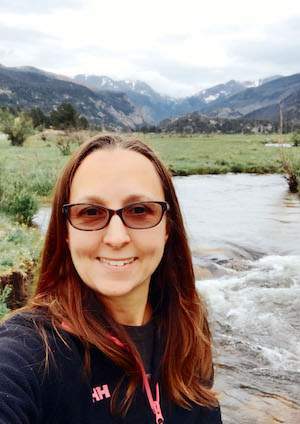 Entries can be submitted by following on social media, subscribing to the Little Family Adventure newsletter, leaving a comment, etc. You can enter daily by tweeting a message too! Must be a US resident, 18 years or older to enter. 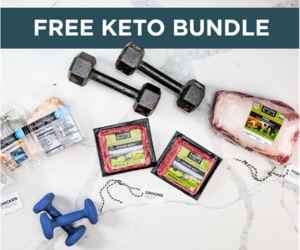 Giveaway Ends August 10, 2017. Winner will be selected at random and notified August 11, 2017. My favorite game to play on family game night is Life. At the moment our favorite game to play together is Spot It! Fun for everyone (6&4year old)! We like to play many different games on game night, but Machi Koro is our favorite at the moment. Ticket to Ride is always a family favorite! Our current favorite is Happy Salmon! I like Mice & Mystics though it is still too much for my kids to play with out help. We are moving in to Catan Junior.